Continuing our stroller feature, I bring to you new-to-USA Kiddy City’n Move, a well-priced lightweight umbrella stroller with features that rival its more expensive competitors. We have been awaiting the American release of this stroller ever since last year and finally it is here and it couldn’t be better. We got to test drive it pretty well during our trip to Disney. Let me go over the stats and features, as well as give my personal opinion from weeks of use. Aluminum chassis is light but stable. It’s not the lightest of the umbrella strollers, but it is so packed with features that it’s a worthy concession to make. It’s still light enough that it’s perfect for travel, especially if you want your baby to be comfortable and need more than a basic, what I call, “doll stroller”. 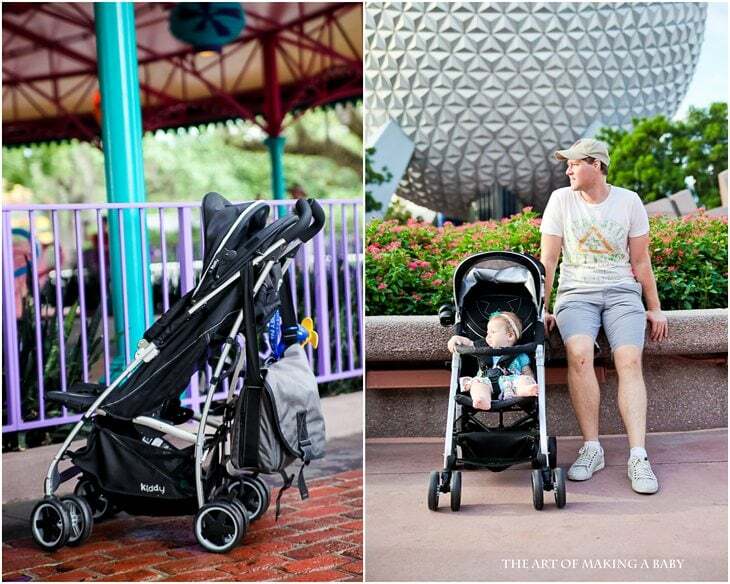 This is BY FAR one of the best features of the stroller that alone makes it trump most other umbrella strollers. It has nearly FULL SUN protection. The kind that I haven’t seen before. If you look at the pictures, it has a flap at the bottom that completes the coverage giving as good of sun protection as one can get in a stroller. The fabric has 80UPF protection as well.This really came in handy at Disney, and is the main reason why we used the stroller more than carriers. Florida’s midday sun is brutal, but couples with sunscreen this stroller made it completely comfortable and safe for little Lexi. It almost looks like you can’t see anything, but I lowered myself to her level and her view is just fine. There are a few features to the seat itself that I am a big fan of. First, there’s the mesh netting, which allows for air flow and keeps her cool. Really important here in Florida. It has a nice recline, in that awesome case your baby likes to sleep in the stroller and it is very easy to operate. But the biggest thing is the comfort and ergonomics of the seat. It is certified by the Healthy Backs Foundation and it could be my bias showing, but both Andrew and I noticed that when we use it at home, she definitely seems more comfortable in it than some other strollers we’ve used. 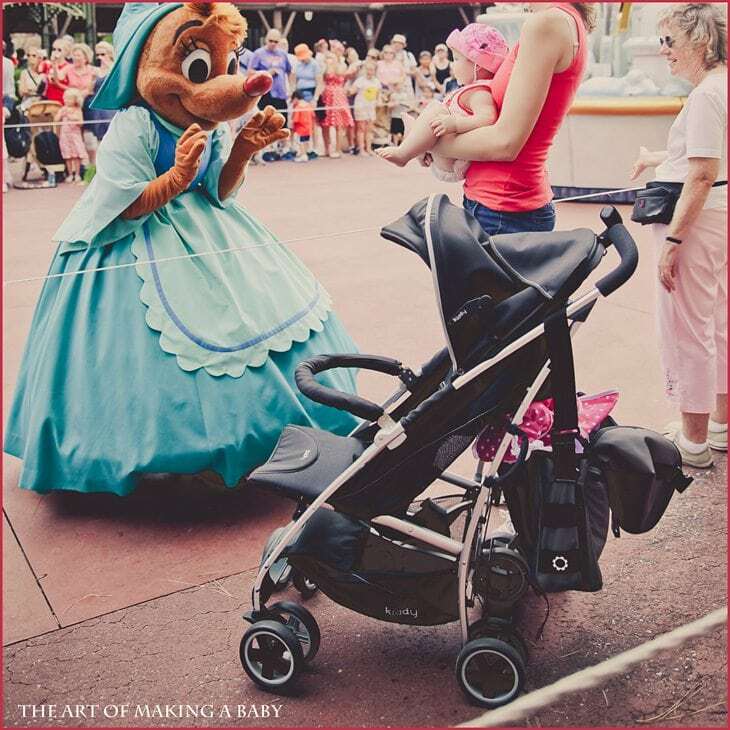 Alexis isn’t a fan of sleeping anywhere but the bed and she hates being reclined, however Disney was pretty exhausting for her, so she slept in her stroller once, as well as didn’t seem to protest being reclined once in a while when she was tired. She also complains whenever she gets too hot in a stroller and it didn’t seem to be an issue with this one. Though, of course, it’s not magical, so I can’t say she never whined to get out of her stroller on other days when she didn’t feel like being there. Most umbrella strollers don’t have a large or easily accessible storage baskets. Kiddy has a decent size one that unzips for better access. It’s not huge but it’s perfect for an umbrella stroller. You can use it FROM BIRTH. With one of the car seat adaptors (Chicco, Maxi Cosi, Peg Perego, Graco), you can pop an infant car seat into it and voila, your lightweight stroller now carries your newborn. From what I understand, not many umbrella strollers have that feature. This is a great and uncommon feature and anyone who has used an umbrella stroller will attest to it. Unlike most lightweight strollers, Kiddy HOLDS A HEAVY DIAPER BAG unoccupied without tipping it back! This was really a BIG BIG DEAL at Disney. You try to pack up everything you might need at the park, which makes your diaper bag pretty heavy. Coupled with walking all day in the heat, the last thing you want to do is carry/hold your heavy diaper bag. 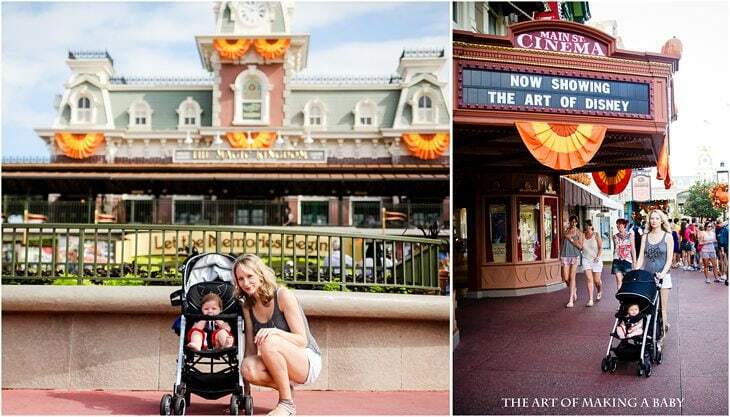 Being able to hang it on the stroller to go on a ride or during a parade was really convenient. Removable cupholder, 4 wheel suspension, stroller lock, removable bumper bar. CONS: It’s not the lightest of the the umbrella strollers. It’s light enough for me to carry on my own, but it still weighs 21 pounds. I feel like that’s the trade off for all the features it has that most other umbrella strollers lack. But that’s something that needs to be taken into account. And this is knit picky, but I really like when the seat is machine washable. This seat cover isn’t removable (or at least easily removable. We tried but it was so complicated that we stopped for the fear of not being able to snap it back in). You can spot clean it with water and soap but I like to run my stroller seats through a washing cycle before I put Lexi in it. So all-in-all this is the first stroller I have tried in this affordable price range that has the features of more expensive strollers, not too heavy and accommodates babies of all ages. 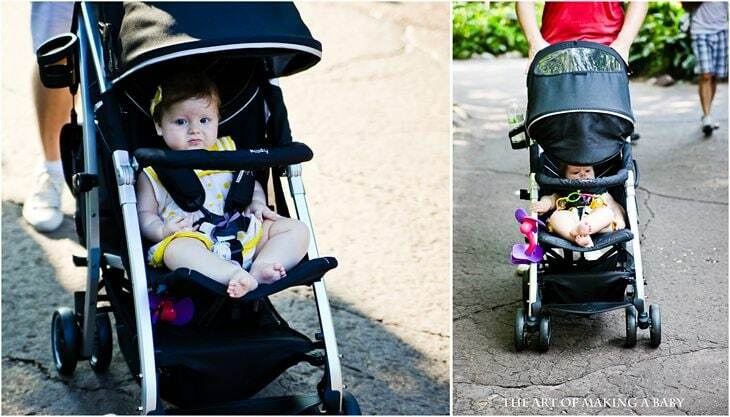 It is a great addition to the market of foreign designed (Germany) strollers. As a matter of fact, this is the stroller I recommended that my BFF who’s pregnant buys due to its excellent price and features. This stroller will most likely appeal to frequent travelers who like the idea of their child riding in comfort and having a more versatile, feature packed stroller, those who want a light stroller but tend to tow around a big diaper bag that they need to hang on the stroller. It will be good for chidren with back issues. For anyone who doesn’t own a car and tends to walk most places, it will provide portability and comfort for their baby over long distances. 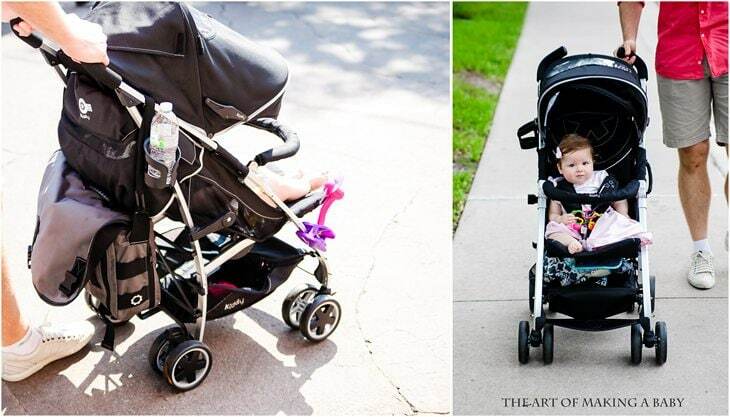 Below are the colors available for this stroller (plus the black in my pictures), which in my opinion rock! To learn more about the stroller, visit KIDDY USA website. They are also a maker of amazing and highly rated car seats. Disclosure: I was sent this stroller by Kiddy USA to facilitate the review. All opinions are my own and 100% honest, as always. Just a comment-it is really difficult to read comments with your new format on the iPhone. Maybe it’s just mine? I can’t enter the giveaway because it will only display half of the entry box. Has anyone else had this problem. Sorry to be the stick in the mud. Any suggestions? Oh yeah I know about mobile comments 🙁 sorry! I’ll try to fix it when I get a second. I’ve never heard of or seen this stroller, but it looks awesome! Elena, you have helped so much. I’m 39 weeks pregnant and 5 days and i’ve read every blog post of yours and I think i’m super prepared lol…I’m just afraid of beign induce. Hopefully I will have the contractions before like u did. Don’t be afraid of being induced. With birth, it will go the way it will go, all that matters is your baby. It will be fine!! Can we please not encourage parents to hang their diaper bags on the backs of strollers? Glad it worked for you, but every stroller I’ve had, the manual specifically says not to. In fact, even my big sturdy double stroller has a warning against it right on the canopy. This stroller allows a diaper bag being hung on it. It’s on the biggest features. I’m glad that you were able to hang your diaper bag from your stroller without incident- to be honest, my diaper bag came with stroller hooks and I have used them a few times when I had both of my children in the stroller and felt the bag was light enough to not pose a risk… But I would feel irresponsible advising other people to do the same. No one is advising anything. People should definitely think for themselves. I’ll look up the manual and see if it actually says it can be hung. I know it’s marketed as one of the features on an EMPTY stroller, not occupied . AND it won’t tip even if empty. Occupied- even more! Just a follow up: it’s not mentioned in the manual because based on the structure of the chasis system, it was noticed after the fact. Hey Elena! Love your blog, love the reviews. We bought the Nordic carrier based off of your rec and our baby girl LOVES it, I seriously don’t know how I would get errands run without it since she HATES being in her car seat. What did you think about the smoothness of the ride on this stroller? I love the idea of a lightweight stroller, and as we’re in central Texas I have the same need for a good umbrella and a seat that won’t make her overheat. The problem is that I prefer the smooth ride of jogging strollers, our city has tons of great parks we love to visit and I’m concerned about how a stroller with hard plastic wheels would handle grassy terrain. The smoothness is definitely better than other umbrella strollers I’ve tried. On really bumpy surfaces it shakes a bit, but normal sidewalks are perfectly smooth. it’s not as smooth as super expensive strollers with air tires but you won’t get a super smooth umbrella stroller regardless. I’ll pay more attention to that next time we use it and report. Okay, seriously, how many strollers do you own? I’ve seen the Origami on one of your posts, this one, and a red one. At least 3? 🙂 Why so many? Lol purely for review purposes for the blog. Origami I won in a giveaway. But don’t you have to report the value of all of these strollers that have been given to you as revenue on your tax return? I’m not trying to be snarky, I just don’t understand how a “for profit” blog works. In the past year, you have probably reviewed at least $5,000 worth of products that have been given to you. I could see if you turned around and sold the strollers and car seats that you aren’t using but I just don’t understand what the monetary gain is to you. It seems like it is costing you $ – tax $. When you donate an item, the value of that item is taken off your taxes. So you break even. I don’t do reviews for monetary gain. I do it for content and readers, because I enjoy discovering new product and of course it’s nice to keep the items you end up loving the most. Wow I love the color selection… so much to choose from! Purple is my favorite! What do you plan on doing with all these strollers? No one needs this many strollers. When I am done doing reviews on them, I will either give them away to pregnant friends, or donate. I love that you call 200 dollars for an umbrella stroller ‘affordable.’ It doesn’t look much better than what I considered to be expensive 100 dollar umbrella stroller. I think I’ll stick with mine rather than ‘upgrade.’ heh. In my opinion $100 for a typical but ok quality umbrella stroller is appropriate. But this isn’t just a simple umbrella stroller. It’s a full featured one to be used with a car seat at birth. Not many strollers can make that claim. And those that can are significantly more expensive. Which one do you have btw, I am just curious? You are so stinking kind to these rude commenters. I seriously don’t think I’d be polite. I’m thinking of buying an umbrella stroller but can’t seem to make my mind up on buying a Kiddy or Summer Infant 3D lite convenience stroller. Cost wise, the city’n move is on sale for $99 on Zulily right now and the Summer infant is $80 through Target. I like the options on both stroller, but like the lite weight feature on the Summer infant. What are your thoughts? Right now, I have a Baby Trend ELX travel system jogging stroller. I love it, but it’s so bulky and heavy. Oh city n move is on sale for $99!!! That’s an amazing deal!!!!!! City and Move is a great stroller, but it’s not VERY light, you know. It’s more about comfort with the convenience of not having a 26 pound frame. If you child is under 2, I’d go with city n move. Older kids don’t really mind less comfortable basic strollers. I listed all the features of the Kiddy one but really without having tried Summer stroller and not knowing EXACTLY what your needs are, it’d be hard to advise.